On August 18, 2012, the grand finale unfolded: a free rock concert bus tour. On blackened rock formations of their choice, local Sudbury musicians performed: Silver Birch String Quartet (Alexandra Lee, Geoff McCausland, Christian Robinson, Jane Russell), Justine Giles, Le Paysagiste (Dayv Poulin with Guy Coutu, Matt Foy, Jordan McNeil), Sarah Bradley, Pistol George Warren (Matt Beech, Jonathan Danyliw, Shari Diaz, Matthew Graveline, Pierre Jarbeau, Jen McKerral, Maty Ralph, Steph Saroka, Matt Wiewel), Lightmares (Jamie Millard, Nicholas Millard, Zack Tymchuk), Pandora Topp and La Norme (Dunstan Topp, Jennifer Herd), Marcel Aymar, Faye Blais (with Josh Turnbull), Strange Attractor (Jeffrey Houle with Mitch Houle, Eric Hoop, Rob Seaton, and Fevers (Sarah Bradley, Martin Charbonneau, Jim Hopkins, Colin MacDougall, Mike Stauffer). A group of dedicated bus riders and followers in cars formed a caravan that swelled from 100 to 350 people strong over eleven hours – even including a group of motivated cyclists. They traveled across Sudbury through rain and sun, into the forest, and onto the black rocks seeking out each concert. This series of punk, folk, rock, classical, and electronica concerts by local bands formed a unique map of Sudbury for one day: eleven local bands on eleven swatches of land. One participant commented that, through the medium of music, the black rocks became stages for creative empowerment. Some encountered new musicians among the local musical talent. Others experienced landscapes they didn’t know existed right in their own backyard, discovering a new sense of the place they call home. 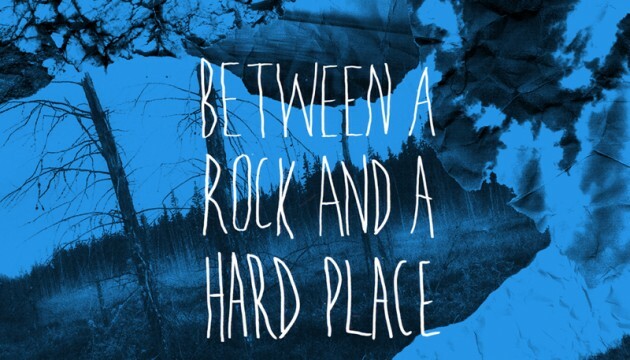 Between a Rock and a Hard Place was a collaboration between Musagetes, the Dutch artists Bik Van der Pol, local Producer Mathieu Grainger, and Sudbury’s home-grown design group Bureau. But it could not have been possible without the community’s openness to adventure and support of this experiment. This concert series, Sudbury’s famous black rock, cultural energies, and diverse musical talent are the subjects of a forthcoming publication, a documentary video, and a vinyl recording, all currently in production. The documentary film was created from dozens of hours of footage of the concerts, interviews with participants and bands, and location shots of the walk up each hill and the riders on the bus. Along with the publication and limited edition vinyl record featuring field recordings from each performance, the film will premiere in Sudbury in June 2014.